The Palin pick was part of the discussion on MSNBC's "Melissa Harris-Perry" this morning, with Harris-Perry asking her panel of guests if the rumor (which by then was fact) was, "Real or fake?" "I hope its fake," said one, while another chimed in about what we all know: "NBC is doing that as counterprogramming to Katie Couric guest hosting "Good Morning America." Cooking with Katie & Sarah could feature all sorts of homespun recipes, like different pies whose crusts are made from a pulpy mixture of every newspaper and magazine on stands that very same day. After baking each pie, Couric could spoon feed it to Palin, but Palin would close her mouth and shake her head because that would be their little shtick, Couric trying to spoon feed Palin and Palin mistaking the spoon for a threat. Katie & Sarah's Book Corner wouldn't be the most erudite show on television, but who's reading anyway when there's so much TV on? Certainly not Sarah Palin, who, halfway through each show, would admit to not finishing the book. That would be Katie Couric's cue to put her hands on her hips, turn to the audience, who would all know to say, "Aww, Sarah!" together. Where in the World Is Katie Couric? would be an educational program that would scare children into being more assiduous geography students as they'd watch in horror Sarah Palin haplessly navigating what she thinks is the globe, but what is actually Epcot. Meanwhile, Katie Couric sips espresso in Rome and watches the coverage of Palin's futile search with a mix of shame and delight. 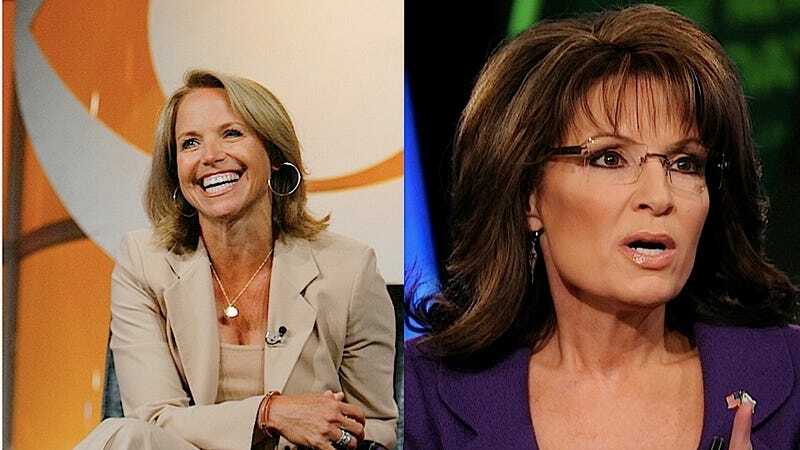 Networks, take heed — there's an untapped oil reserve in television and it's a quirky mix of Sarah Palin and Katie Couric. Sarah Palin, at least, would want to drill for it.